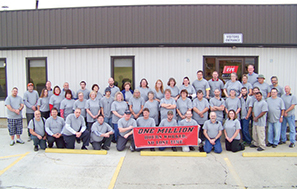 NEW MADISON – Florida Production Engineering (FPE) and Ernie Green Industries recently celebrated one million hours without a loss time accident at its New Madison plant. According to Billy Bryant, plant manager, only a handful of companies nationwide have achieved this milestone. With 82 employees working three shifts, it has taken the New Madison plant six years to hit this mark. Brad Gotts, president of FPE, pointed out the plant is establishing a great trend of quality and safety.